Do cannibals exist? Is there evidence for contemporary human sacrifice? What are vampires? The Buried Soul charts the story of the human response to death from prehistory to the present day. This book is a radical adventure into the sepulchral world. "Taylor makes sense of the ghastly and the seemingly insensible African muti killings, human sacrifice, vampires, and triple-killed bog bodies. Archaeology was never so entertaining, and entertainment never so edifying. Taylor rescues cannibalism from its P.C. detention hall. He hauls ghosts off the Halloween novelty racks and reflects on their ancient status as disembodied souls: dangerous, utterly terrifying entities that had to be trapped, served, tricked, placated. There is not a trite thought or lazy idea in this book. Taylor is blazingly smart and deeply human." 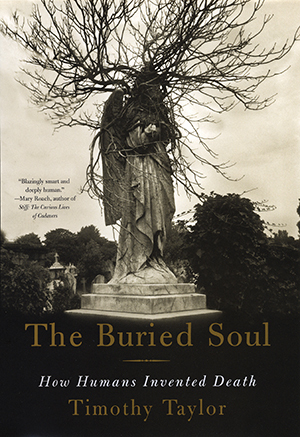 "The Buried Soul, by British archeologist Timothy Taylor, is an extraordinary immersion experience . . . I had always supposed that archeology was as dry as the dust and bones it traffics in, as pedestrian as the catalogs it compiles. On the contrary, when expounded by a masterly storyteller like Taylor, it resembles psychoanalysis at its best...I haven't space to illustrate how ingeniously Taylor assembles his interpretations, patiently working out the barely intelligible motives and beliefs of the creatures who became us . . . Wherever else you travel, you should consider a trip into deep time with The Buried Soul." "Absorbing and challenging . . . The Buried Soul is vast, ambitious, and contentious. It ranges over two million years, from a cut-marked skull of Homo habilis to the death of a young man in 2000."